The Santa Rosa community in Moruca, Region One (Barima/Waini), yesterday (15 December 2018) paid tribute in music and prose to the work and legacy of local educator, musician, scout master and sportsman, the late Victor Patrick Ferreira, MS, at the Santa Rosa Roman Catholic Church. Ferreira, 69, popularly known as Teacher Vic or Sir Vic, died on December 12th at his home in the Santa Rosa community, after a long battle with cancer. 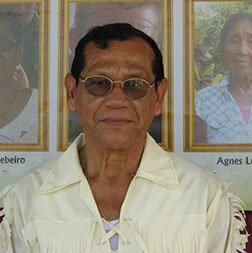 Ferreira was a teacher of many years, serving for many in communities far away from his homestead. For this, he was highly respected by the ordinary man in the communities where he served, and was recognised by the State for long and dedicated service as a teacher, with a Medal of Service in 2011. He was inducted with the status of “A Hero of Moruca” in 2017 by the Santa Rosa Village Council, and in November this year, he was one of five conferred with the IChange Nations – Sydney Allicock Global Humanitarian Award, named after the Minister of Indigenous Peoples’ Affairs for dedicated service to the Indigenous Peoples of Guyana. In 1988, he was the recipient of the Teacher of the Year Award from the Guyana Teachers’ Union. A devout Catholic and father of eight children (two deceased), Ferreira had wanted to become a priest and so joined the St Paul Seminary in his teens but left when he felt the priesthood was not for him. Ferreira first served as a pupil teacher at 17 years old, at the Santa Cruz RC School at the mouth of the Barama River, some 45 miles by river from his Cabucalli, Santa Rosa home. He was later transferred to Kamwatta Primary, which was nearer home but he had to paddle a ‘koryal’ about 12 miles a day, regardless of the weather, from his Cabucalli home to and from Kamwatta. “While it was closer to home, it was still a lot of paddling morning and afternoon but Teacher Carl (Rodrigues), who headed the school, was good company for him,” his daughter, Nadia De Abreu said in the eulogy at a requiem mass held in his honour at the Santa Rosa Church. After teaching for some years, Ferreira entered the Cyril Potter College of Education (CPCE) in 1983 to become a trained teacher. His major was in English Literature, due to his passion for reading, De Abreu said. On his return from CPCE to Region One, he was assigned to Waramuri Primary School, about 10 miles away from his home by boat. After a period of illness, he was transferred to the Santa Rosa Primary School, where he stayed until 1991, “and where, perhaps, his impact was more significant,” De Abreu said. Known as one of the pioneers who worked to establish the Santa Rosa Secondary School, it was Ferreira, attorney David James (formerly a teacher) and RC priest Fr George Vanderwood, who were instrumental in setting up what is now known as the Santa Rosa Secondary School. A few years later, Ferreira established a link with a German school that provided assistance and first time travel opportunities for many of the students from both sides of the world. De Abreu noted that her father was never appointed headmaster of Santa Rosa Secondary School, even though he virtually ran it singlehandedly, having acted in the capacity for many years. “He was distraught and opted to leave the region hoping to feel valued and appreciated in another region,” she related. In 1998, he was appointed headmaster of Kamarang Primary School, hundreds of miles away from his family. “His experience fresh from Santa Rosa Secondary helped him lay the groundwork for the establishment of the Waramadong Secondary School,” De Abreu said. He had to leave Kamarang due to illness and returned to the Santa Rosa community, where he was appointed the headmaster of St Nicholas Primary in Manawarin, many miles from home by boat but was seconded to his “heartbeat” Santa Rosa Secondary, where he retired in 2004. Among his former students are former foreign affairs minister, Carolyn Rodrigues, project officer of the Amerindian Peoples Association, Graham Atkinson, who paid tribute at the funeral, and Colin De La Cruz, head master of Waramuri Primary. Throughout his 30 plus years in the school system, Ferreira taught music and involved the school populations in singing and music related activities. He also served as the regional music coordinator for Region One’s education department. On retirement at 55 years old, he sought employment at the regional level but was unsuccessful. He then served for about 18 months as a cluster trainer under the Basic Education Access Management Programme. At home on retirement, he tried to tend to livestock to supplement his income but without much success. On learning of a vacancy for a principal of the Bina Hill Institute at Annai in the Rupununi, “The selfless soldier,” De Abreu said, left his family in Moruca in northern Guyana and headed to the south of Guyana. There he was until earlier this year when he journeyed back to Moruca to live out the last of his years. In between retirement and his tenure at Bina Hill, Ferreira wrote some 40 songs about life, culture, his love for the Moruca community, nature and social issues among others, and about another 20 about the Rupununi, where he last served. His songs were, however, never professionally produced.